Color me less than thrilled that the Institute of Medicine is now asking for EHRs to capture additional social and behavioral data as part of Meaningful Use Stage 3. That’s assuming that Meaningful Use is still viable now that the money is nearly gone and more than half of ONC’s senior leadership has left in recent months. Practice administrators have been dazed and confused trying to figure out if they are better off trying to apply for hardship exceptions, take advantage of the flexibility rule, or throw in the towel altogether. I recently met a practice administrator who swore up and down her providers were attesting for Stage 2, even though they hadn’t yet installed a patient portal and didn’t have a Direct interface. Then again, she also thought that Patient-Centered Medical Home was some kind of design/construction initiative rather than a practice transformation activity, so I shouldn’t have been surprised. I understand that the Institute of Medicine sees EHRs as a great place to mine data for research, but patients are already weary of having their privacy invaded. Anyone remember the Florida legislation to control whether providers could ask about firearms in the home? My vendor actually had to code in a setting where a practice could hide the firearms questions to avoid running afoul of the law. Although we’re pushing patients to be more engaged and it’s nice to work with them when they are, at least in my world the majority of patients don’t care about engagement. They just want to be treated and get back to work, their kids, or whatever else was going on in their lives before they got sick. They’re not interested in proactively managing their health when they’re living paycheck to paycheck and think that even questions about alcohol and tobacco use (which are clearly linked to major health outcomes with most people understanding their significance) are over the line. When we had to start asking about race and ethnicity, we spent on average two to three minutes per patient explaining why we needed that information and helping patients figure out how to answer the question. Many patients thought they were interchangeable, so we were at the front desk educating them on the vagaries of demographic data rather than collecting their co-pay and speeding them back to see the doctor. At least those particular pieces of demographic information don’t change over the life of the patient, so you only have to ask them once. Now the academic crowd is going to push us to ask about factors that could change at every visit, including depression, education, intimate partner violence, financial resource strain, physical activity, social connections/isolation, and stress. I can tell you without gathering data or an exhaustive chart review that most of my patients would require discussion of the last four. As a good primary care physician, I should be asking about these things anyway, but I want to ask about them at an appropriate time during an appropriate visit, after I have built a relationship with the patient. I don’t want them turned into screeners that my staff has to administer to every single patient so we can avoid being penalized. Will providers be judged on the percentage of patients who follow advice to manage these issues, like we’re currently judged on the number of patients we can convince to go for colonoscopies or mammograms? That’s not what I signed up for as a physician. I should do my best to encourage my patients, but didn’t I spend a lot of time in medical ethics learning about patient autonomy and how the paternalistic model of healthcare delivery has to go? We’re just asking for more cherry-picking by providers as they dismiss non-compliant patients from their panels to improve their numbers. Most patients don’t understand that their data is already being used for research by health plans and other payers without their specific understanding or consent. Sure, it’s probably in the fine print somewhere and it’s either aggregated or de-identified, but if you asked them whether they understand where their data goes or what it’s used for, they would say no. When people think their information might be used in a way they don’t want it to be used (or to be out of their control), they’re going to lie. Mr. H’s recent poll showed that nearly half of HIStalk readers have withheld medical information from a provider due to privacy concerns. I’m one of them, I admit. Parents are lying on the California home language survey because they don’t want their children labeled as “English learners” for fear they will miss out on other educational opportunities. The old medical school adage of “take the amount of alcohol the patient says he uses and double it” reminds us this is not a new phenomenon. How about let’s actually get people to use the EHRs they already have and use them well rather than pushing more minutiae on overburdened end users? A friend of mine has an EHR with a great onboard reporting tool, yet hasn’t leveraged it at all for actual clinical care. 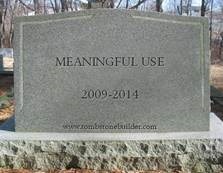 They’re so busy trying to get their patient portal enrollment numbers up and micromanaging the rest of their “all or none” Meaningful Use metrics that they’ve lost their ability to do cancer prevention outreach, immunization campaigns, or other interventions that have been actually proven to save money as well as improve people’s lives. And that, dear readers, is a shame. 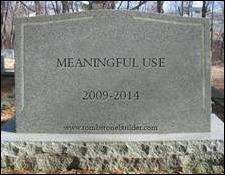 What do you think should be in Meaningful Use Stage 3? Email me. Glad to hear you see and feel the tone deafness of the IOM about MU. I can’t even write what my partners said when I told them the “list”….Well Mrs Smith what is your census median income? We have completely thrown in the towel. We will NOT be a part of MU. Ever. We have an EHR, we had it customized and forget anything that is out of our workflow, is unsafe, or not secure. We are going old school EHR, make the EHR work for us. We are not sweating out audits, or doing numerators or denominators, etc etc. We just have too many other things to worry about. So for Stage 3, they can make it whatever they want, because we are not doing it. From the looks of the MU2 numbers, they have more than our group to convince. Maybe on the coasts there are plenty of EPs, but in the center, we are very short on EP supply, and they cannot afford to lose all of us if we leave, retire, stop seeing medicare medicaid and or others. I would suggest MU3 is postponed until they figure out how to fix MU2. What wrong with learning from your failures? Probably just better to realign MU PQRS VBM HIPAA ACO etc etc. Don’t forget we are also dealing with ICD10, MOC, MOL, CME, etc etc. Its also time again to think about phasing in ICD10, instead of a hard date. Let everyone come into the new code set at their own pace. See what works and what doesn’t. Did they not learn anything from the failed ACA rollout? There is no way to end to end test with a hard date. So lets let everyone take a deep breath and let us just use our EHRs. Let the vendors make them usable, safe and secure. Which they are nowhere near any of those now. I have been in healthcare for nearly 30 years and the erosion of privacy has been exponential these last few years. Even when I wrote that my health information could not be used for research purposes without first contacting me for permission for each research project, I was basically laughed at. The person getting my signature told me to tell my provider, my provider told me to contact the Clinic Manager who then told me to contact Public Relations who told me to contact….. By this time I assumed they were selling my information without my permission and were doing everything possible to prevent me from stopping their profitable side business. Yes we need data, yes we want people involved in their healthcare but at some point we also have to acknowledge that people have the right to their bodies; it’s theirs not ours. For those tied to politics – both sides are a fault – Republicans are obsessed with women’s reproductive organs and Democrats want to protect everyone. The best things the Government can do for the overall health of the nation is to repair our infrastructure so it’s safe to go to the doctors, protect us from pollution, make sure our food supply is safe and ensure we have access to health care. I think MU has accomplished as much as it can. I think now that additional requirements are just causing physicians in private practice to ignore the program while those who are employed have others who are complying in their organizations, while physicians tune out. One of the things that drives me crazy about MU is all of the stuff that centers around the problem list. That list was developed for paper charts because people had to plow through reams of paper without a way to organize things by problem or system. I have not yet seen an EMR that actually needs a problem list. The problem lists get longer and longer because people forget to end problems and MU requires them. They just add clutter and make the EMRs less usable, in my humble opinion. I worry that MU at this point does more harm than good in stifling innovation and preventing vendors from taking time to make their products more usable. We may not even be using EMRs in 10 years as new disruptive technologies develop. I think that more consistent standards just have to be implemented for interoperability. Perhaps we would have more interoperability if vendors weren’t struggling with all the measurement requirements.